© 2010 The McGraw-Hill Companies, Inc. 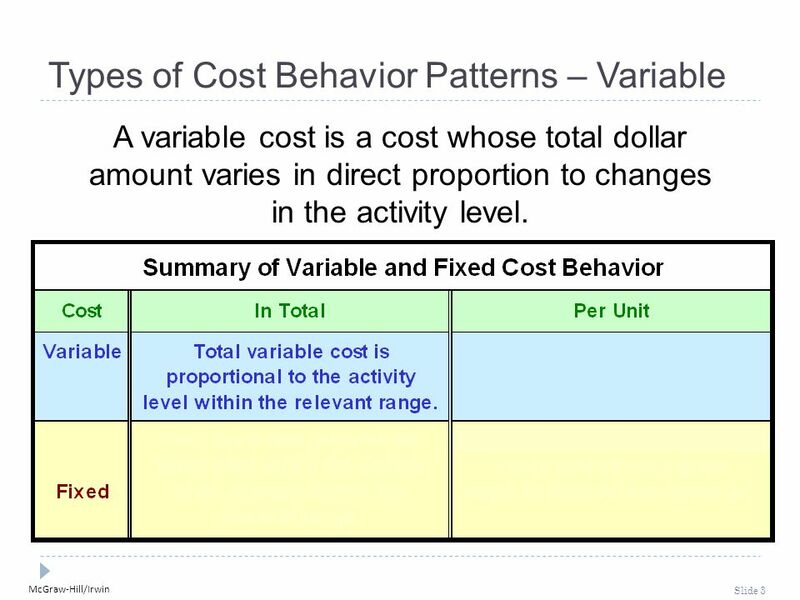 Cost Behavior: Analysis and Use Chapter 5. 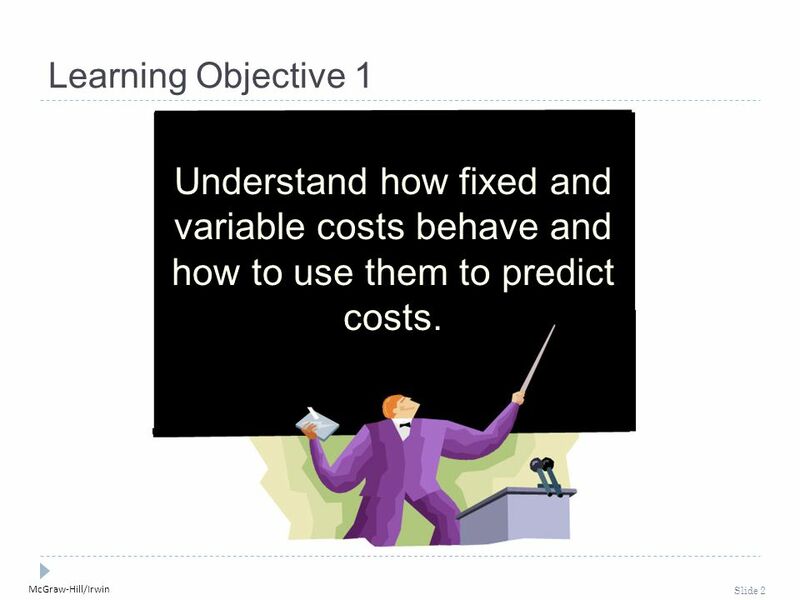 2 McGraw-Hill/Irwin Slide 2 Learning Objective 1 Understand how fixed and variable costs behave and how to use them to predict costs. 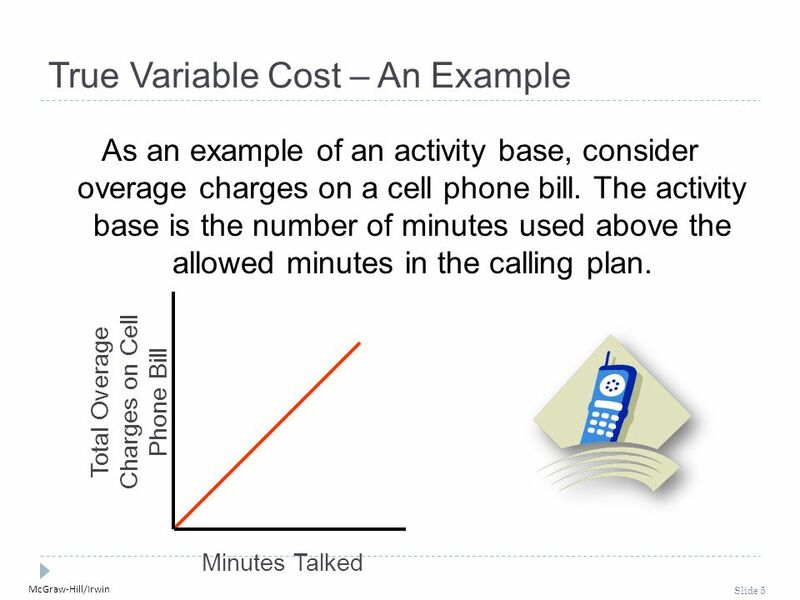 5 McGraw-Hill/Irwin Slide 5 Minutes Talked Total Overage Charges on Cell Phone Bill True Variable Cost – An Example As an example of an activity base, consider overage charges on a cell phone bill. The activity base is the number of minutes used above the allowed minutes in the calling plan. 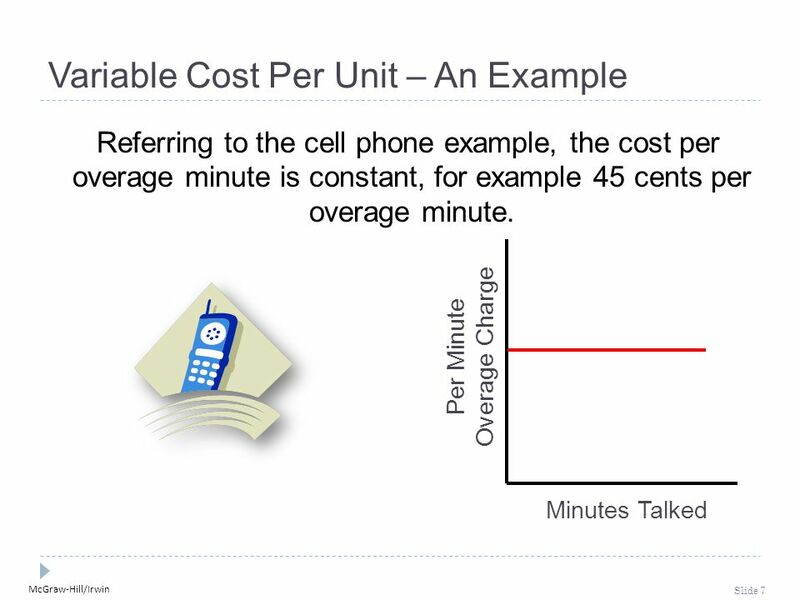 7 McGraw-Hill/Irwin Slide 7 Minutes Talked Per Minute Overage Charge Variable Cost Per Unit – An Example Referring to the cell phone example, the cost per overage minute is constant, for example 45 cents per overage minute. 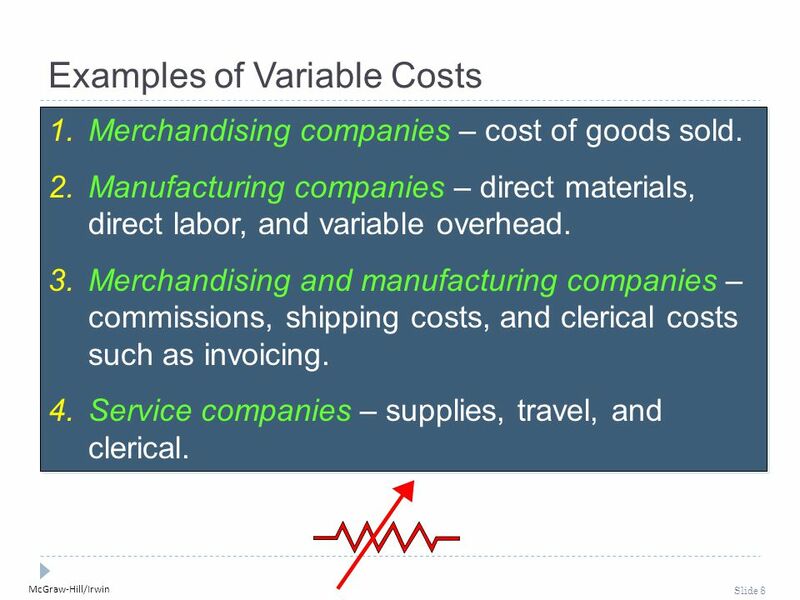 8 McGraw-Hill/Irwin Slide 8 Examples of Variable Costs 1.Merchandising companies – cost of goods sold. 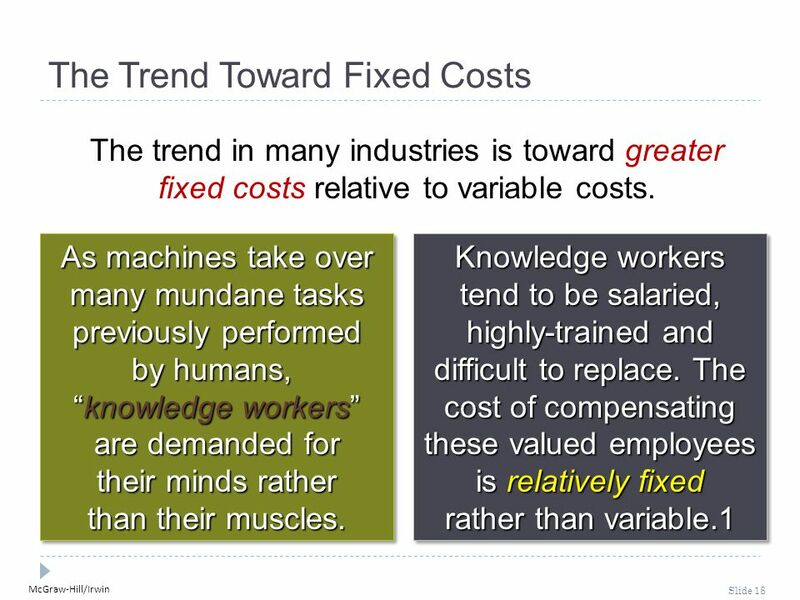 2.Manufacturing companies – direct materials, direct labor, and variable overhead. 3.Merchandising and manufacturing companies – commissions, shipping costs, and clerical costs such as invoicing. 4.Service companies – supplies, travel, and clerical. 1.Merchandising companies – cost of goods sold. 2.Manufacturing companies – direct materials, direct labor, and variable overhead. 3.Merchandising and manufacturing companies – commissions, shipping costs, and clerical costs such as invoicing. 4.Service companies – supplies, travel, and clerical. 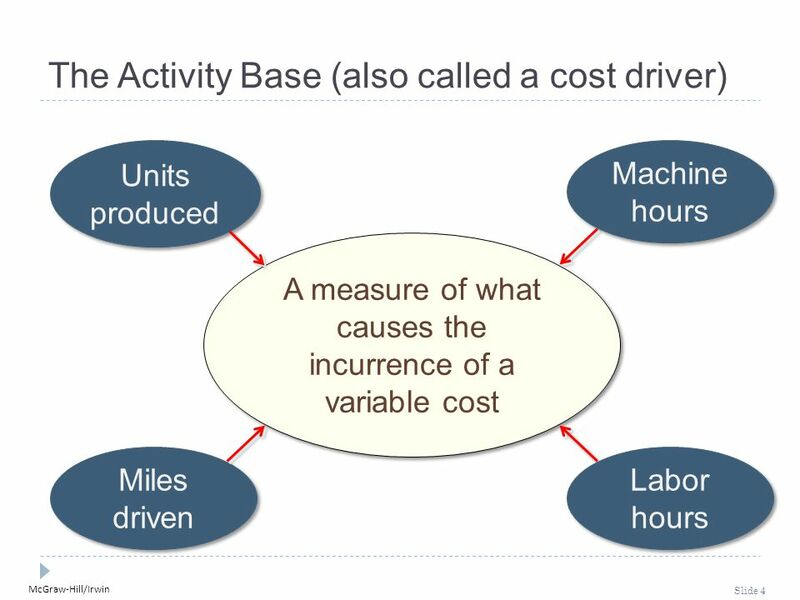 9 McGraw-Hill/Irwin Slide 9 Volume Cost True Variable Costs The amount of a true variable cost used during the period varies in direct proportion to the activity level. 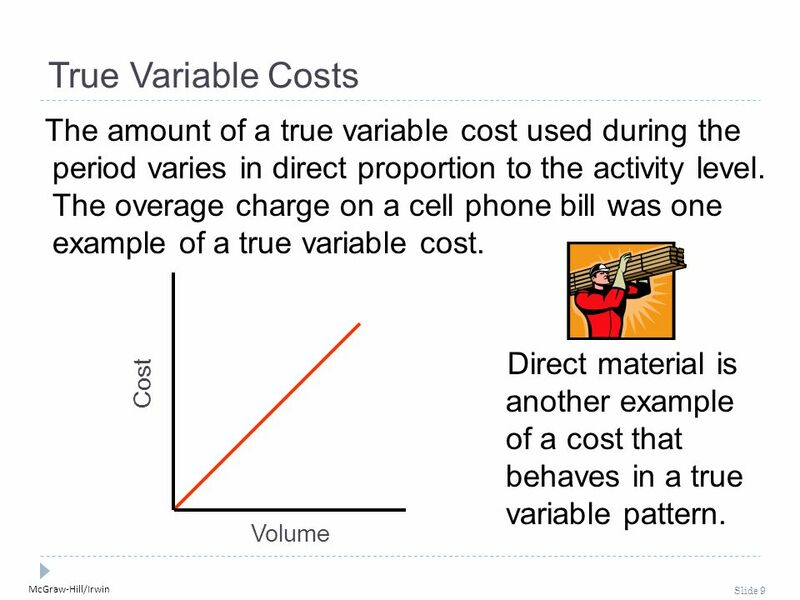 The overage charge on a cell phone bill was one example of a true variable cost. 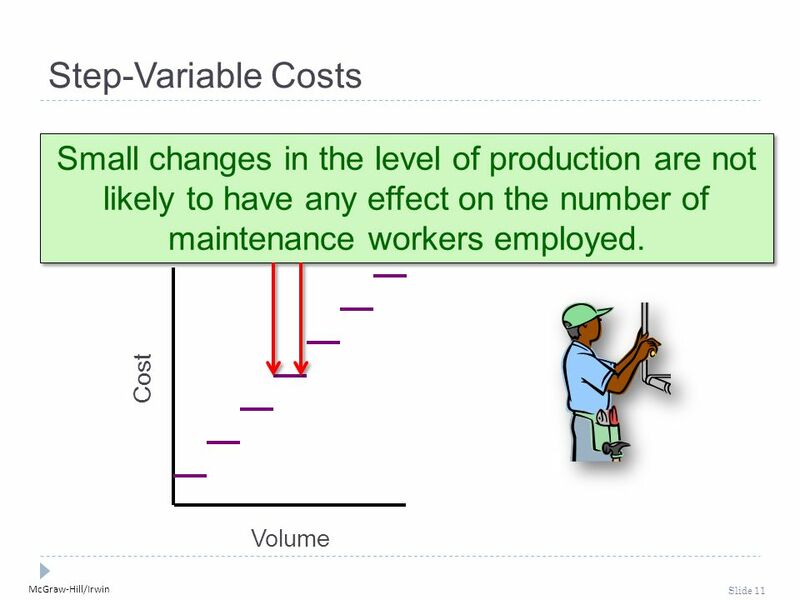 Direct material is another example of a cost that behaves in a true variable pattern. 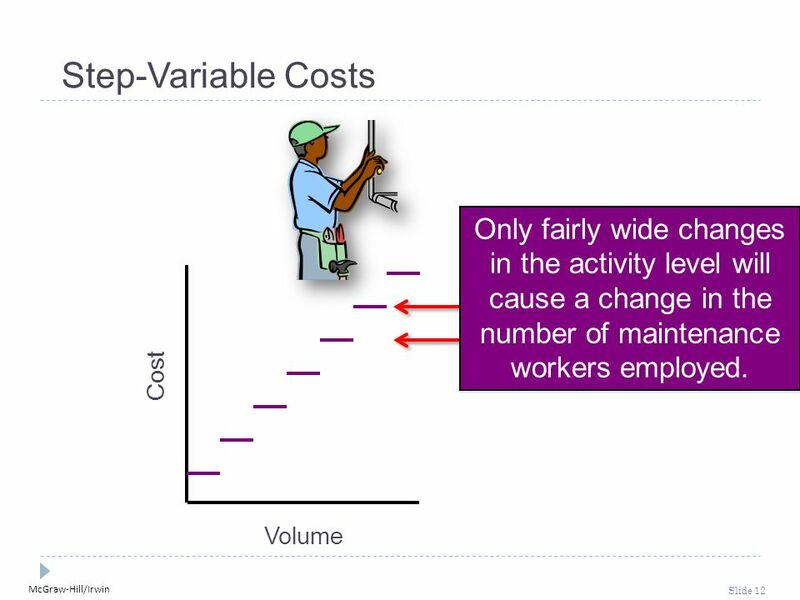 12 McGraw-Hill/Irwin Slide 12 Step-Variable Costs Volume Cost Only fairly wide changes in the activity level will cause a change in the number of maintenance workers employed. 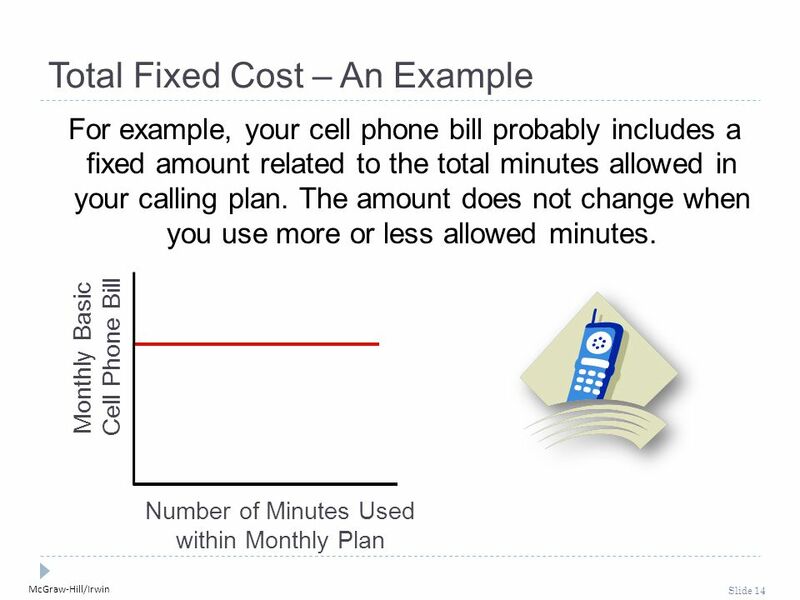 14 McGraw-Hill/Irwin Slide 14 Number of Minutes Used within Monthly Plan Monthly Basic Cell Phone Bill Total Fixed Cost – An Example For example, your cell phone bill probably includes a fixed amount related to the total minutes allowed in your calling plan. The amount does not change when you use more or less allowed minutes. 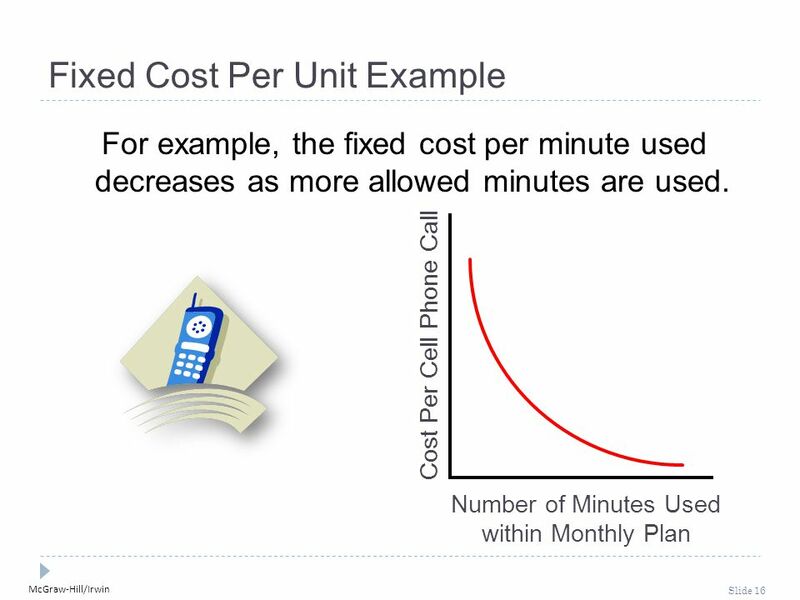 16 McGraw-Hill/Irwin Slide 16 Number of Minutes Used within Monthly Plan Cost Per Cell Phone Call Fixed Cost Per Unit Example For example, the fixed cost per minute used decreases as more allowed minutes are used. 17 McGraw-Hill/Irwin Slide 17 Examples Advertising and Research and Development Examples Advertising and Research and Development Examples Depreciation on Buildings and Equipment and Real Estate Taxes Examples Depreciation on Buildings and Equipment and Real Estate Taxes Types of Fixed Costs Discretionary May be altered in the short-term by current managerial decisions Discretionary May be altered in the short-term by current managerial decisions Committed Long-term, cannot be significantly reduced in the short term. Committed Long-term, cannot be significantly reduced in the short term. 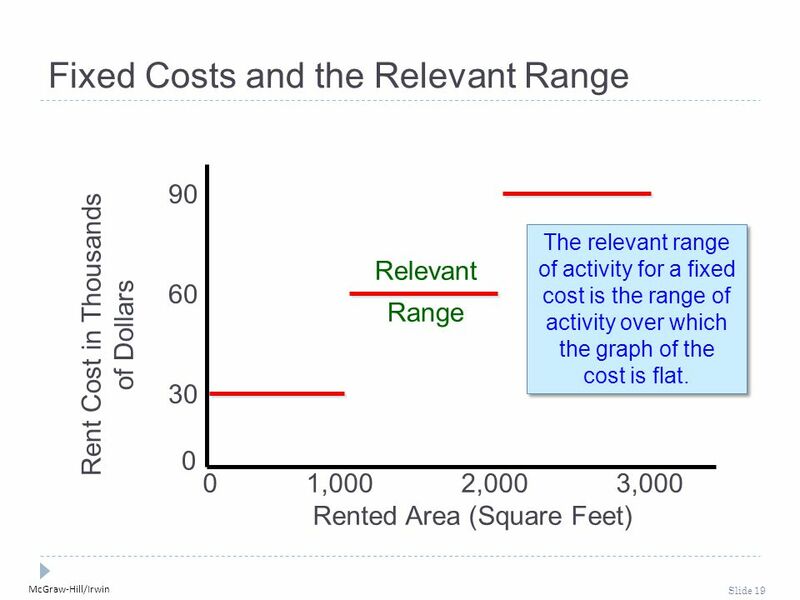 19 McGraw-Hill/Irwin Slide 19 Rent Cost in Thousands of Dollars 0 1,000 2,000 3,000 Rented Area (Square Feet) 0 30 60 Fixed Costs and the Relevant Range 90 Relevant Range The relevant range of activity for a fixed cost is the range of activity over which the graph of the cost is flat. 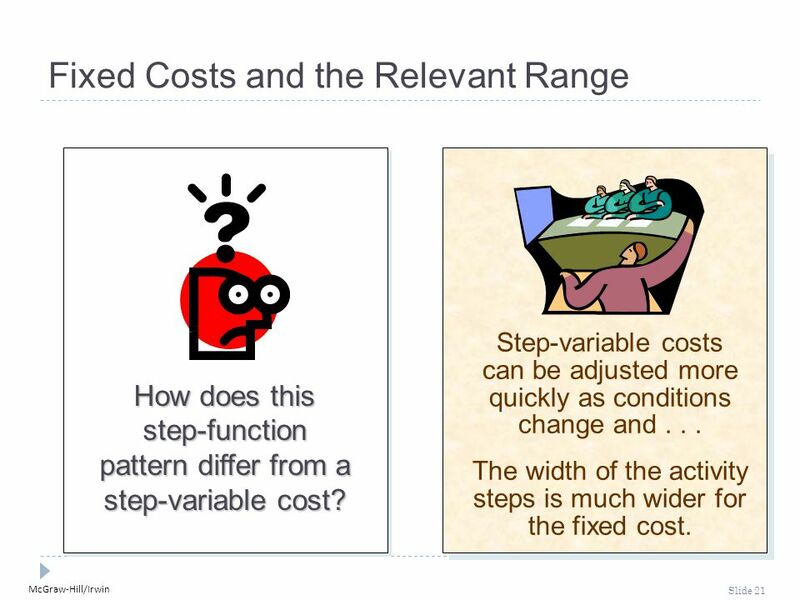 20 McGraw-Hill/Irwin Slide 20 Fixed Costs and the Relevant Range Fixed costs would increase in a step fashion at a rate of $30,000 for each additional 1,000 square feet. 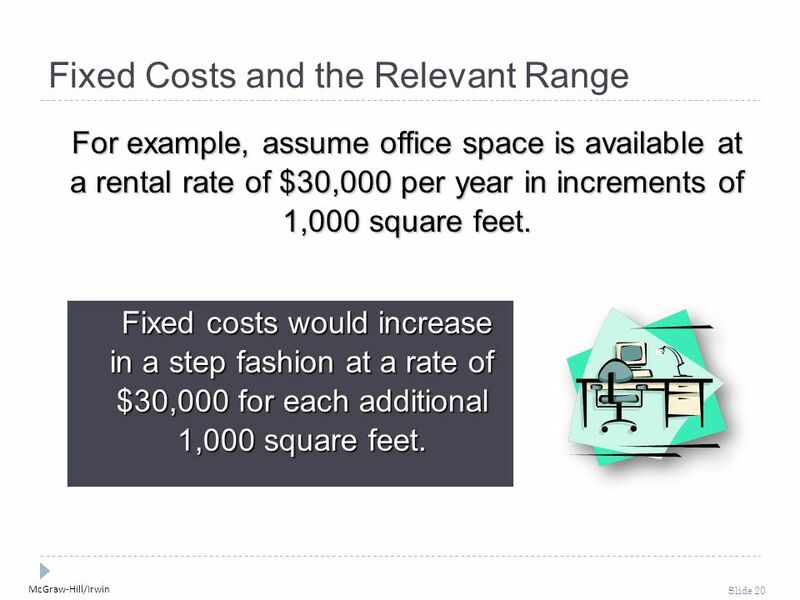 Fixed costs would increase in a step fashion at a rate of $30,000 for each additional 1,000 square feet. For example, assume office space is available at a rental rate of $30,000 per year in increments of 1,000 square feet. 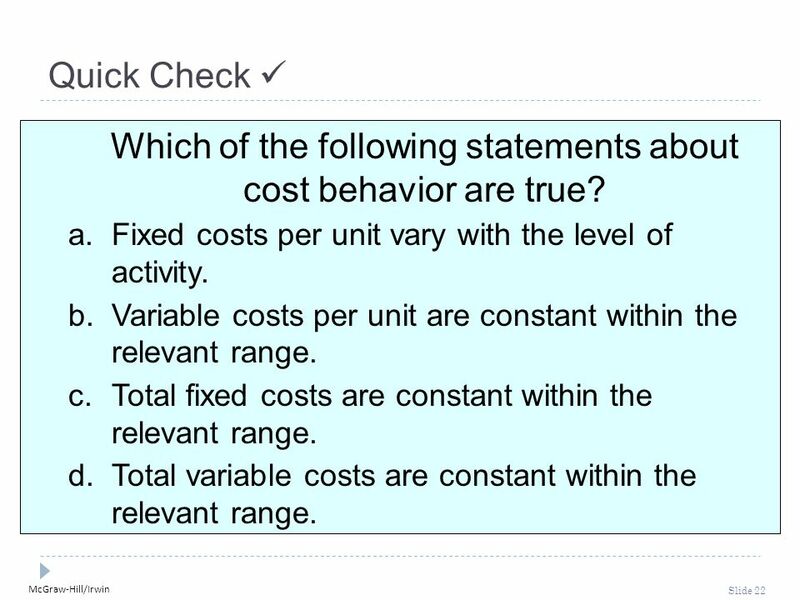 22 McGraw-Hill/Irwin Slide 22 Quick Check Which of the following statements about cost behavior are true? 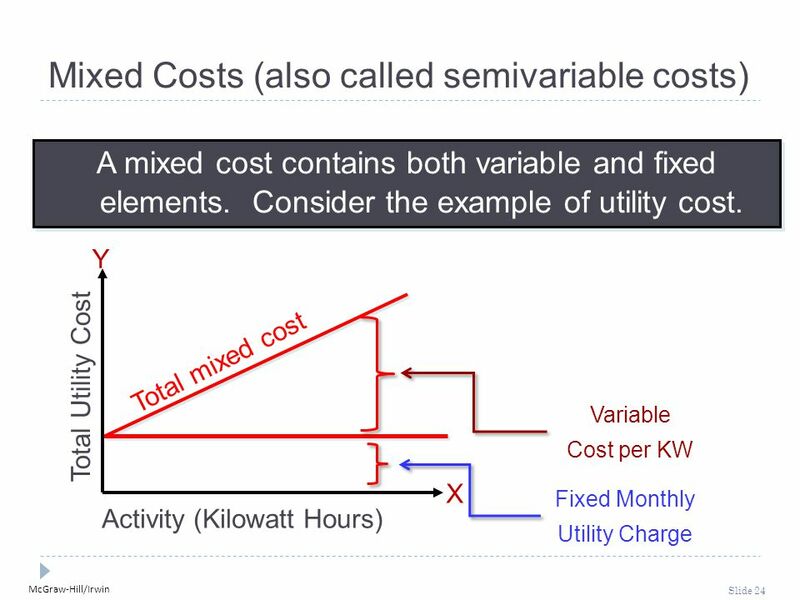 a.Fixed costs per unit vary with the level of activity. 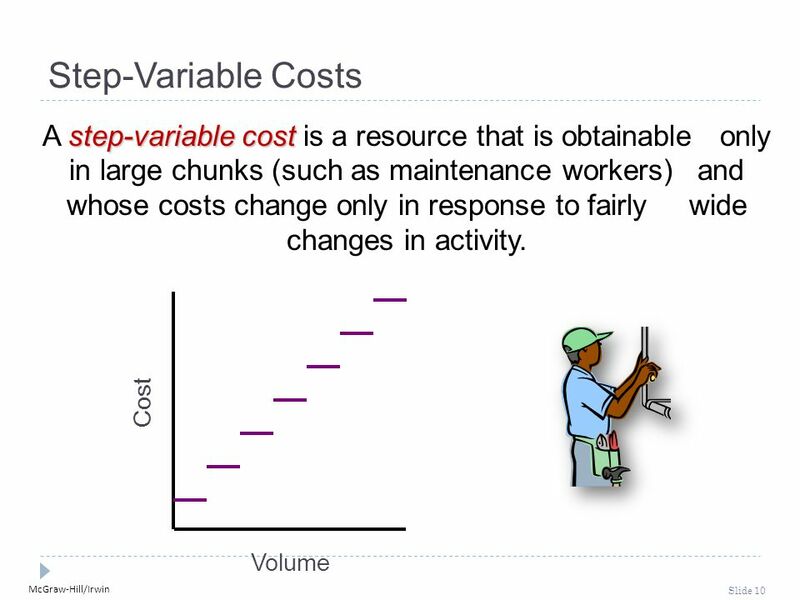 b.Variable costs per unit are constant within the relevant range. 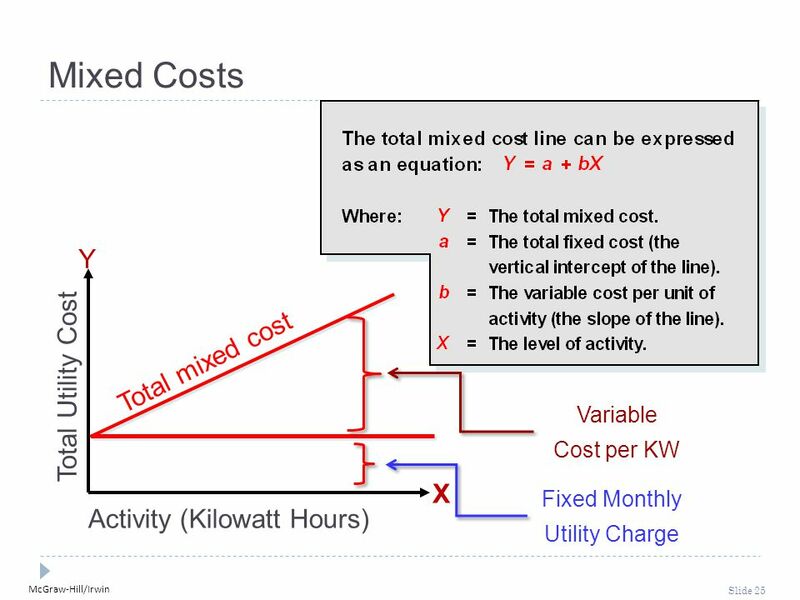 c.Total fixed costs are constant within the relevant range. 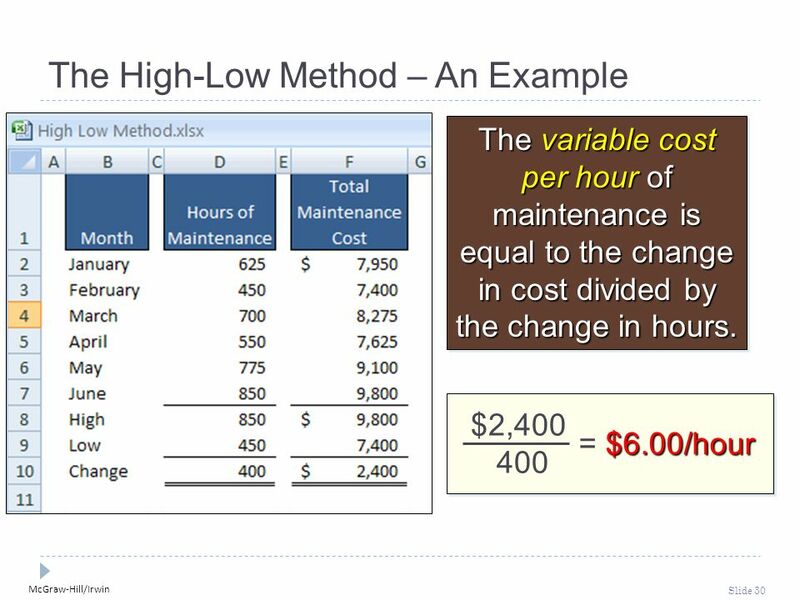 d.Total variable costs are constant within the relevant range. 28 McGraw-Hill/Irwin Slide 28 Learning Objective 3 Analyze a mixed cost using the high-low method. 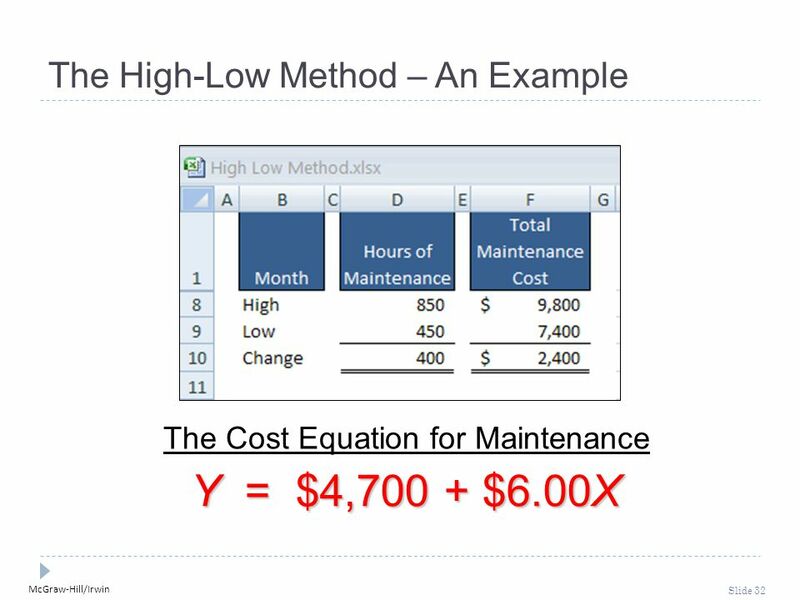 29 McGraw-Hill/Irwin Slide 29 The High-Low Method – An Example Assume the following hours of maintenance work and the total maintenance costs for six months. 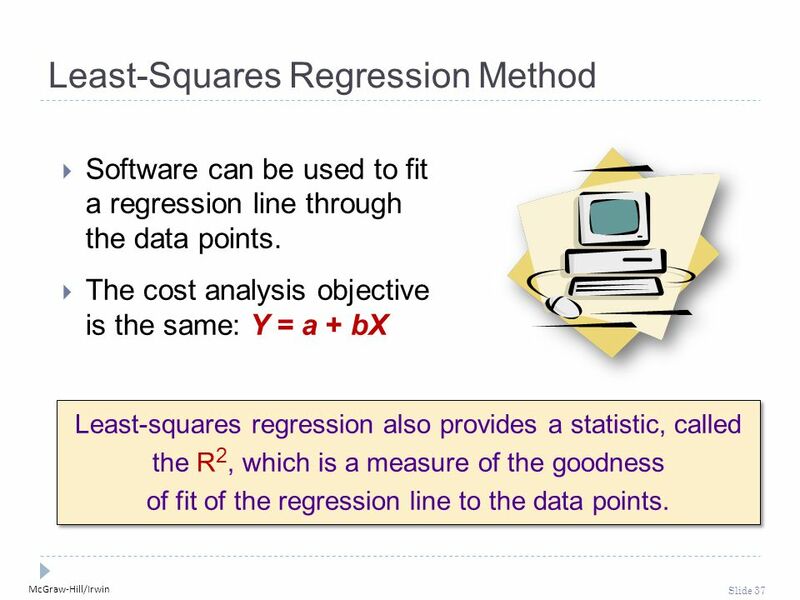 37 McGraw-Hill/Irwin Slide 37 Least-Squares Regression Method  Software can be used to fit a regression line through the data points. 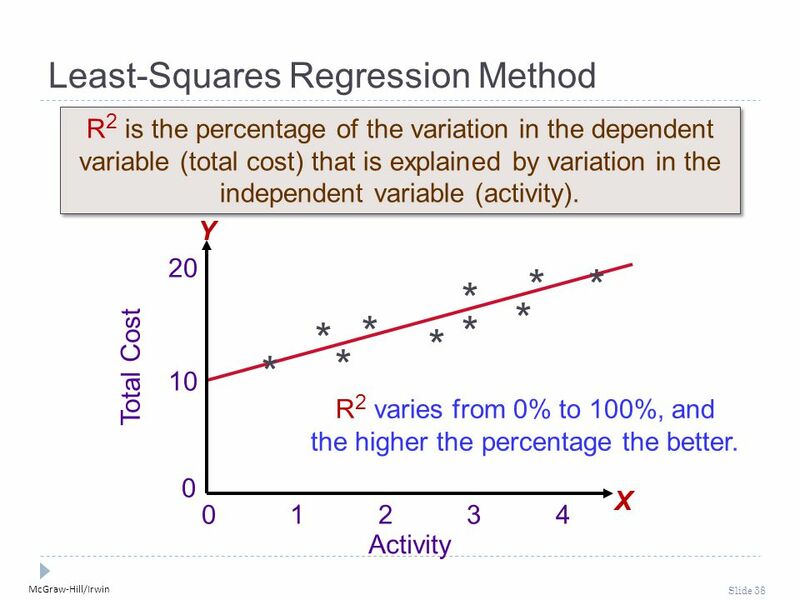  The cost analysis objective is the same: Y = a + bX Least-squares regression also provides a statistic, called the R 2, which is a measure of the goodness of fit of the regression line to the data points. 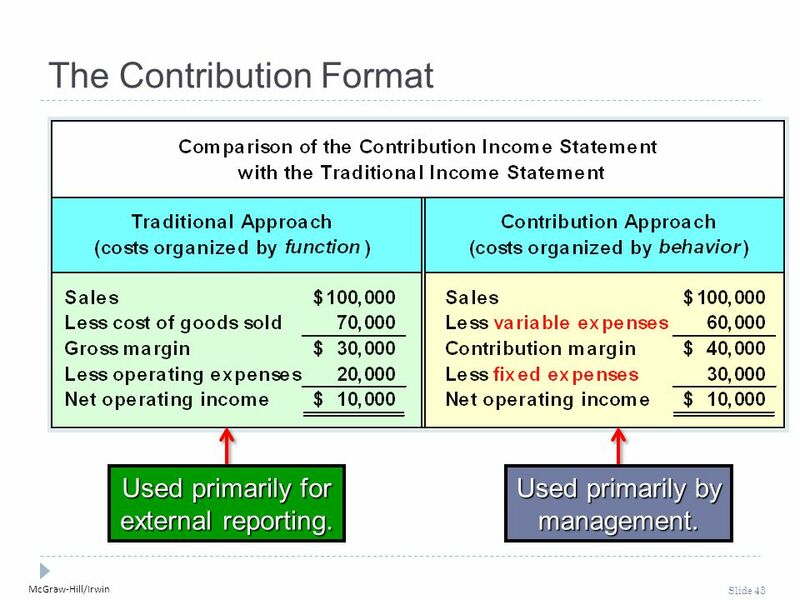 39 McGraw-Hill/Irwin Slide 39 Learning Objective 4 Prepare an income statement using the contribution format. 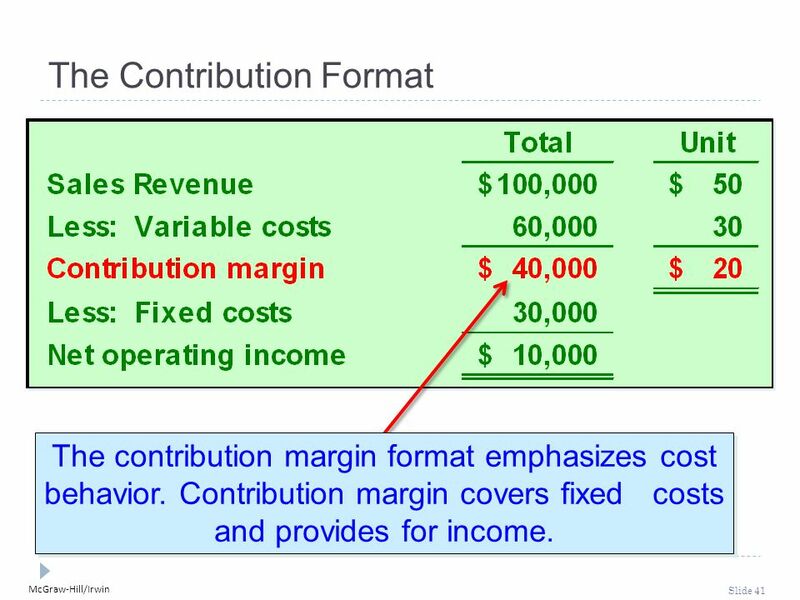 41 McGraw-Hill/Irwin Slide 41 The Contribution Format The contribution margin format emphasizes cost behavior. 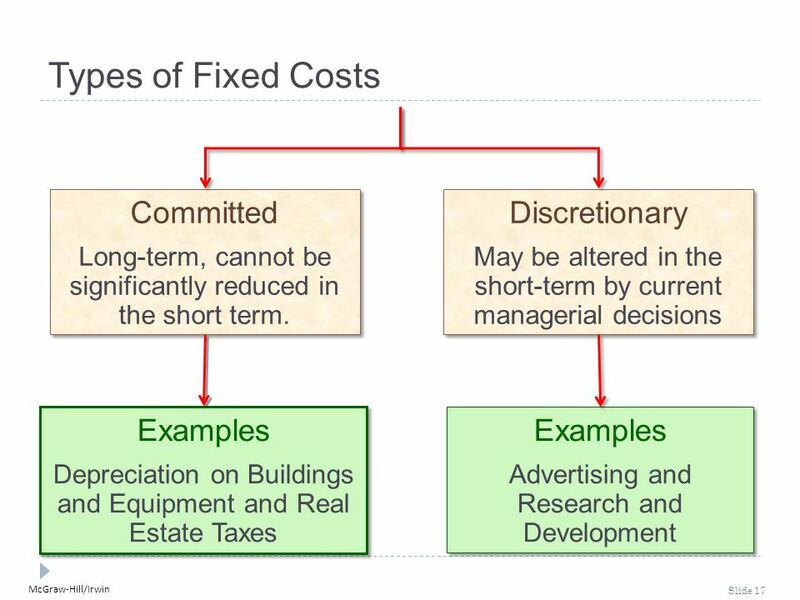 Contribution margin covers fixed costs and provides for income. 42 McGraw-Hill/Irwin Slide 42 Uses of the Contribution Format The contribution income statement format is used as an internal planning and decision-making tool. 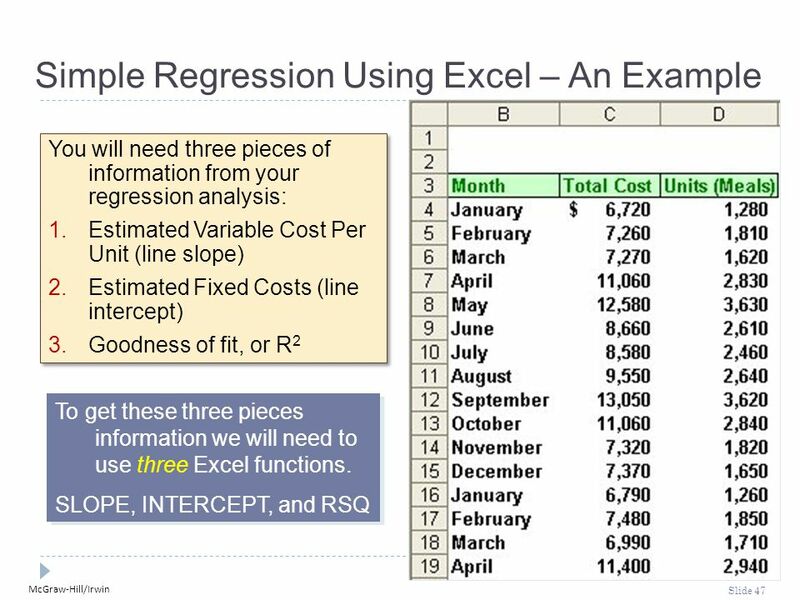 We will use this approach for: 1.Cost-volume-profit analysis (Chapter 6). 2.Budgeting (Chapter 9). 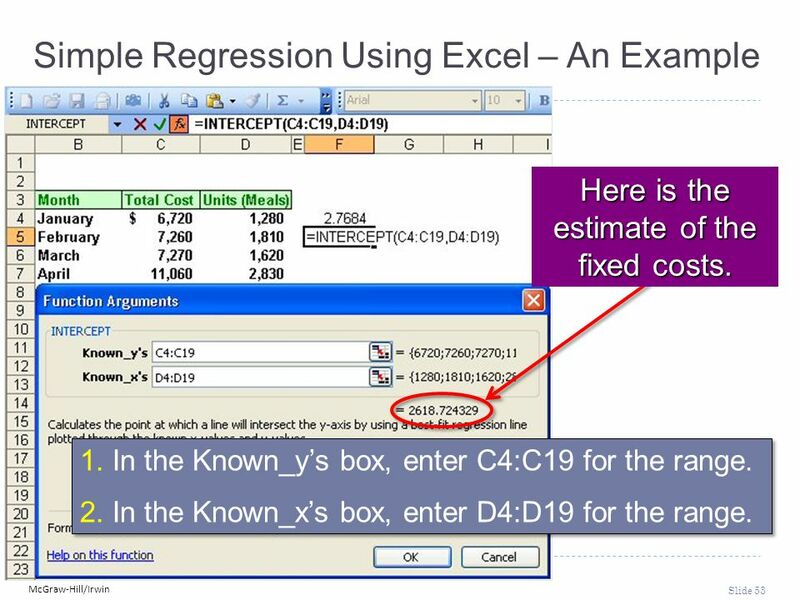 3.Segmented reporting of profit data (Chapter 12). 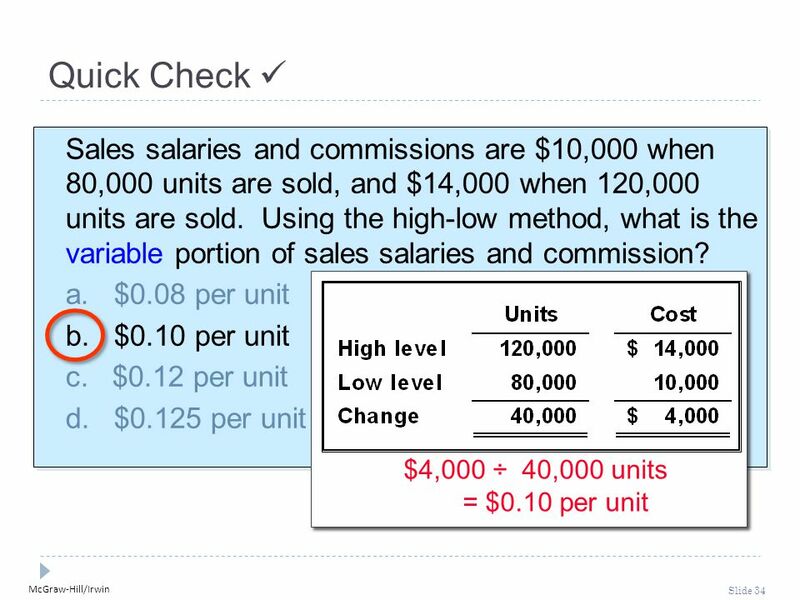 4.Special decisions such as pricing and make-or- buy analysis (Chapter 13). 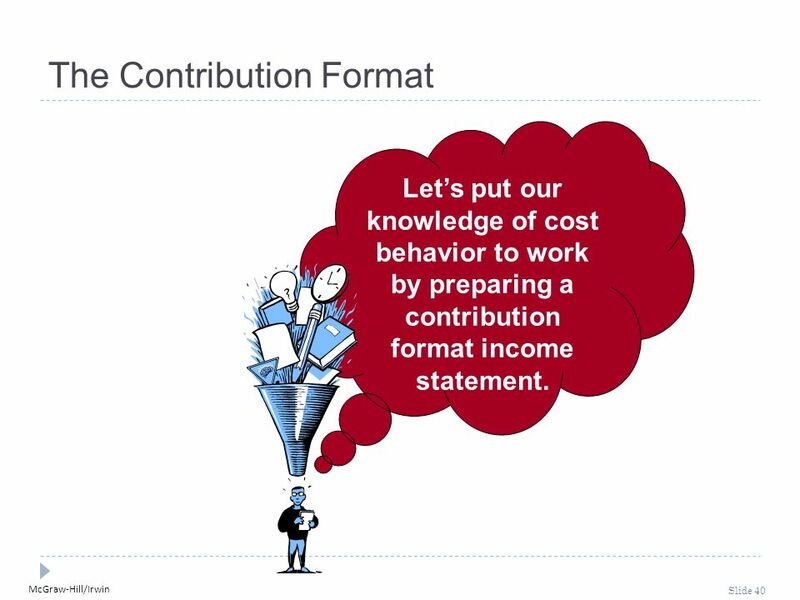 The contribution income statement format is used as an internal planning and decision-making tool. 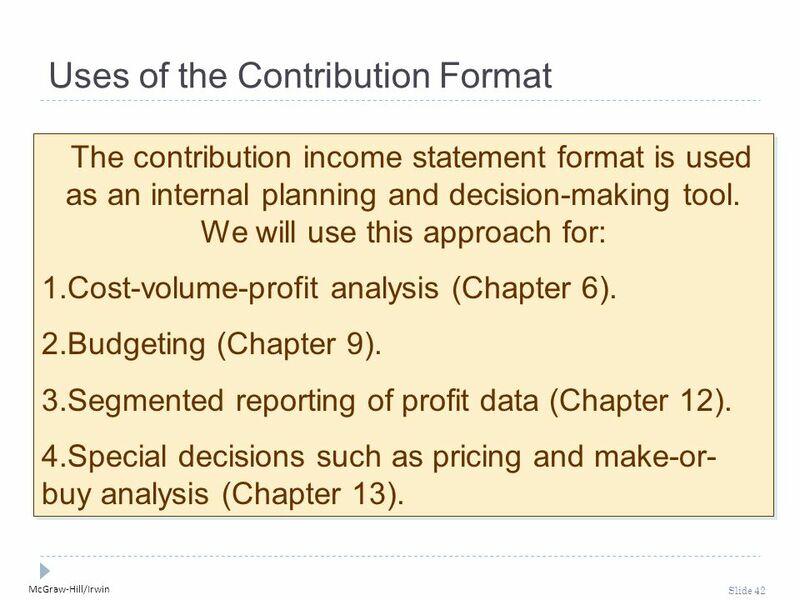 We will use this approach for: 1.Cost-volume-profit analysis (Chapter 6). 2.Budgeting (Chapter 9). 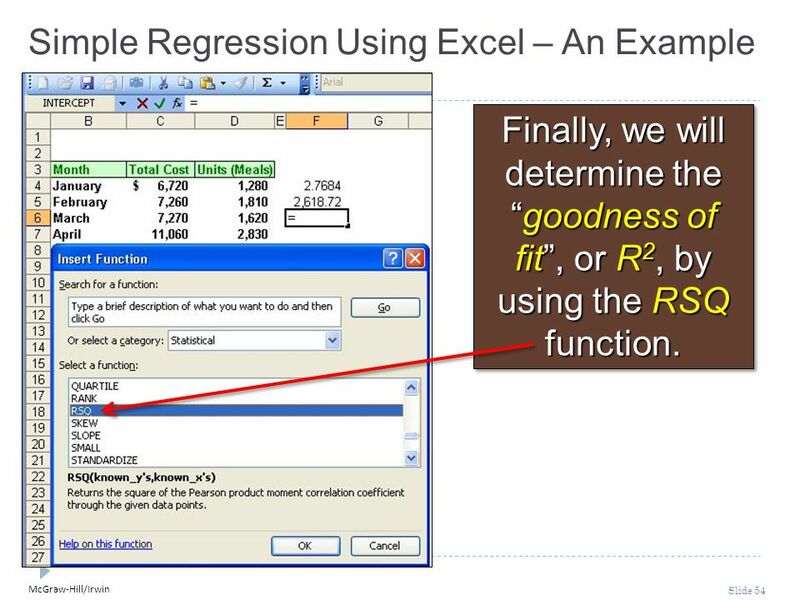 3.Segmented reporting of profit data (Chapter 12). 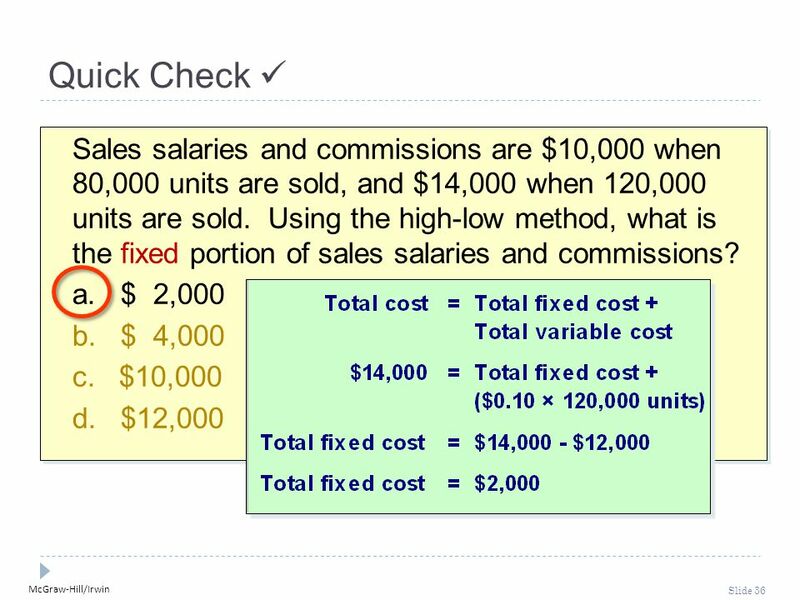 4.Special decisions such as pricing and make-or- buy analysis (Chapter 13). 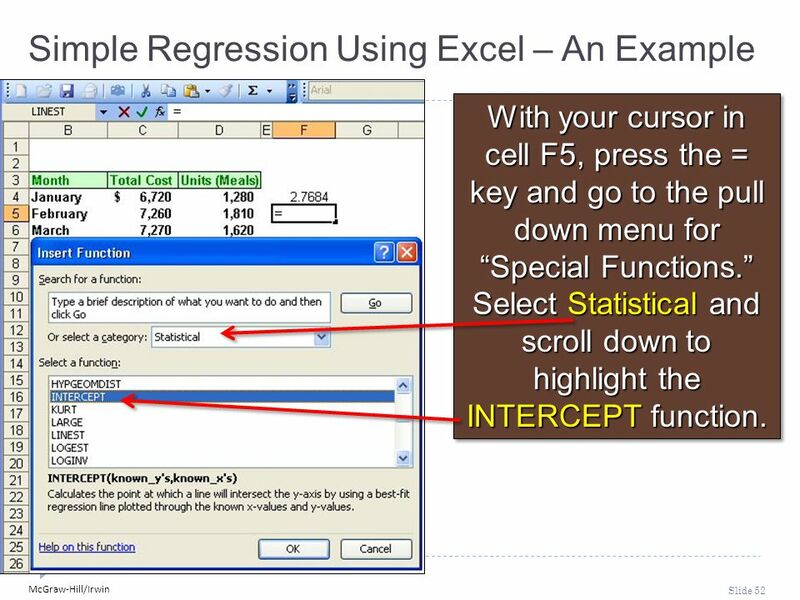 43 McGraw-Hill/Irwin Slide 43 The Contribution Format Used primarily for external reporting. Used primarily by management. 45 McGraw-Hill/Irwin Slide 45 Learning Objective 5 Analyze a mixed cost using the least-squares regression method. 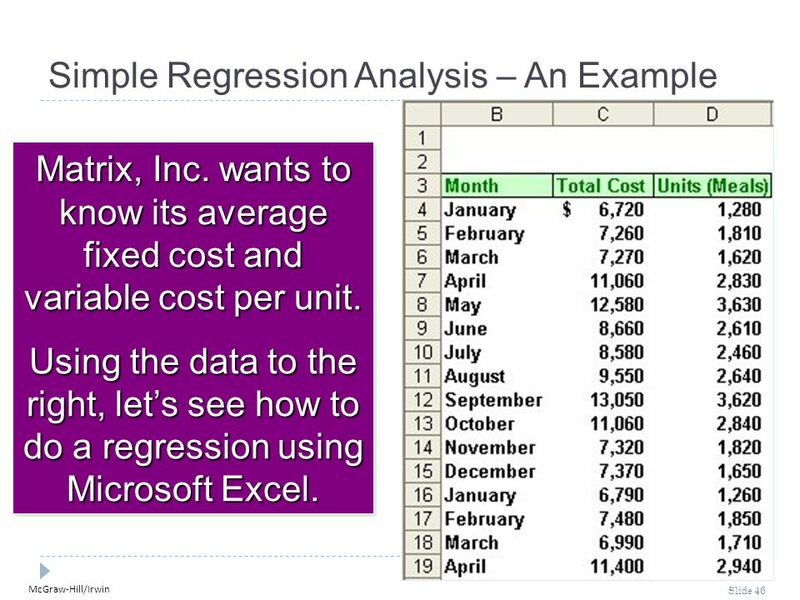 46 McGraw-Hill/Irwin Slide 46 Simple Regression Analysis – An Example Matrix, Inc. wants to know its average fixed cost and variable cost per unit. 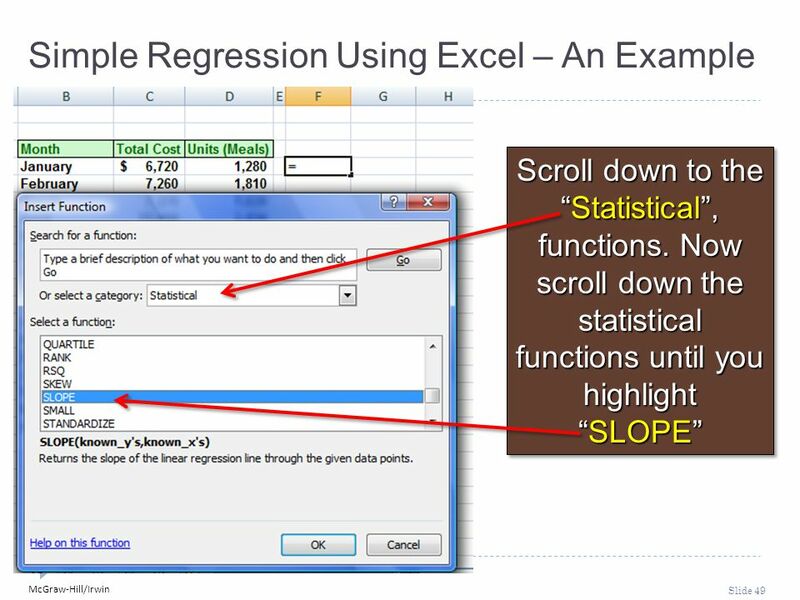 Using the data to the right, let’s see how to do a regression using Microsoft Excel. 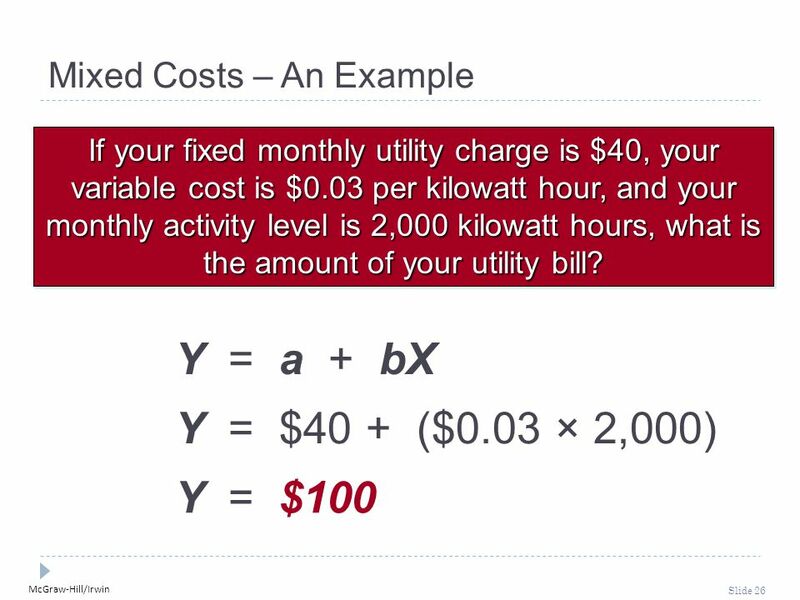 Matrix, Inc. wants to know its average fixed cost and variable cost per unit. 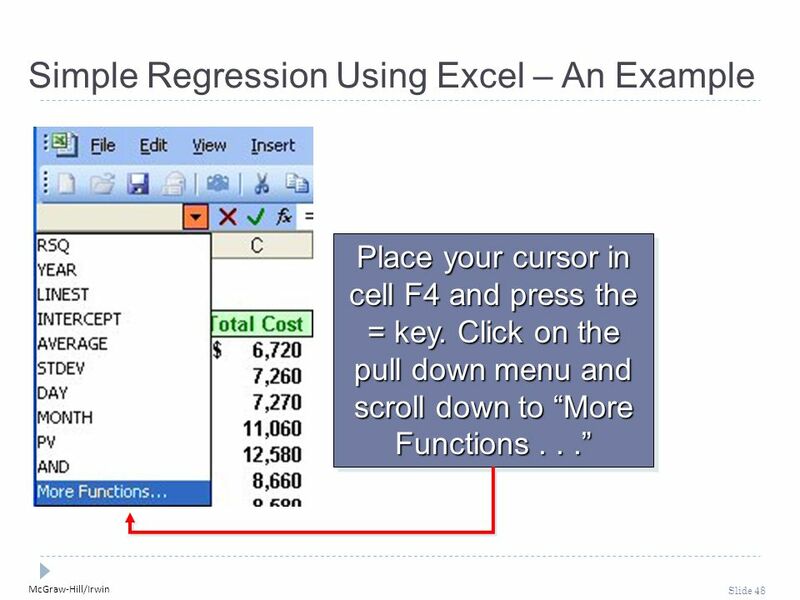 Using the data to the right, let’s see how to do a regression using Microsoft Excel. 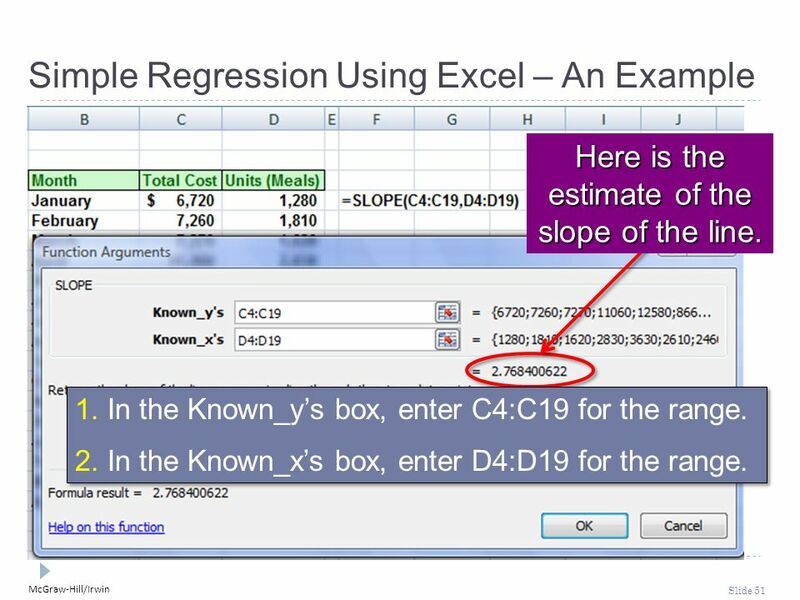 51 McGraw-Hill/Irwin Slide 51 Here is the estimate of the slope of the line. 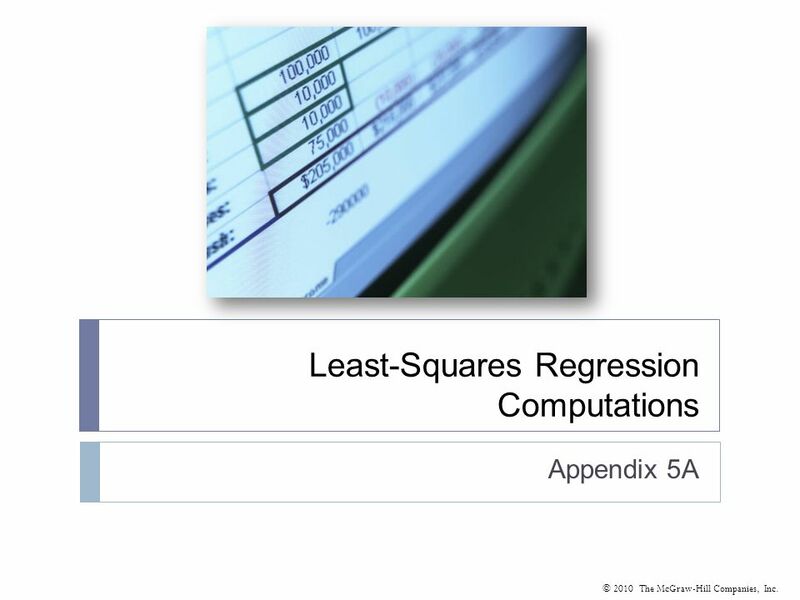 Simple Regression Using Excel – An Example 1. 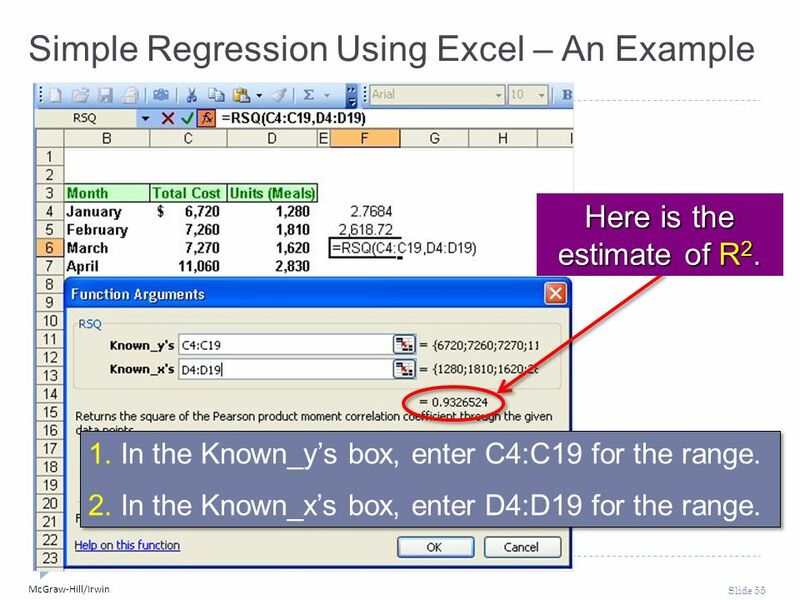 In the Known_y’s box, enter C4:C19 for the range. 2. In the Known_x’s box, enter D4:D19 for the range. 1. In the Known_y’s box, enter C4:C19 for the range. 2. In the Known_x’s box, enter D4:D19 for the range. Download ppt "© 2010 The McGraw-Hill Companies, Inc. 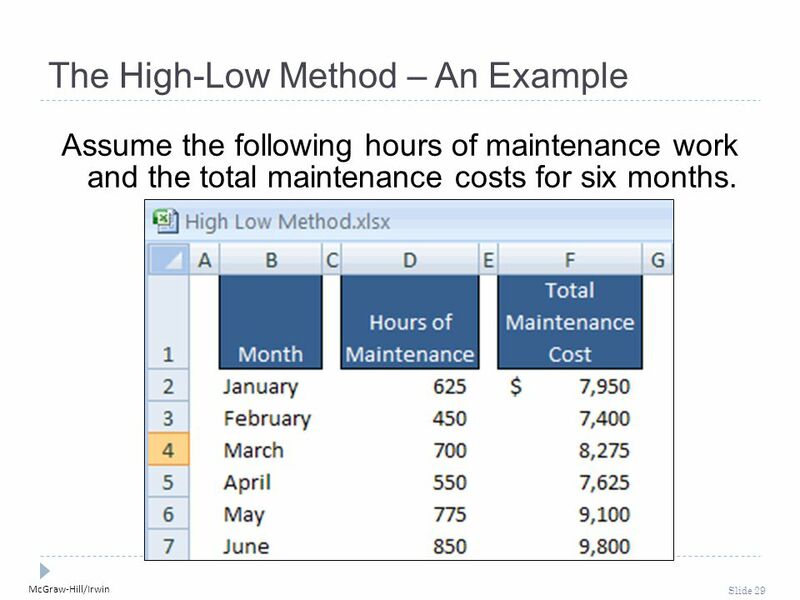 Cost Behavior: Analysis and Use Chapter 5." 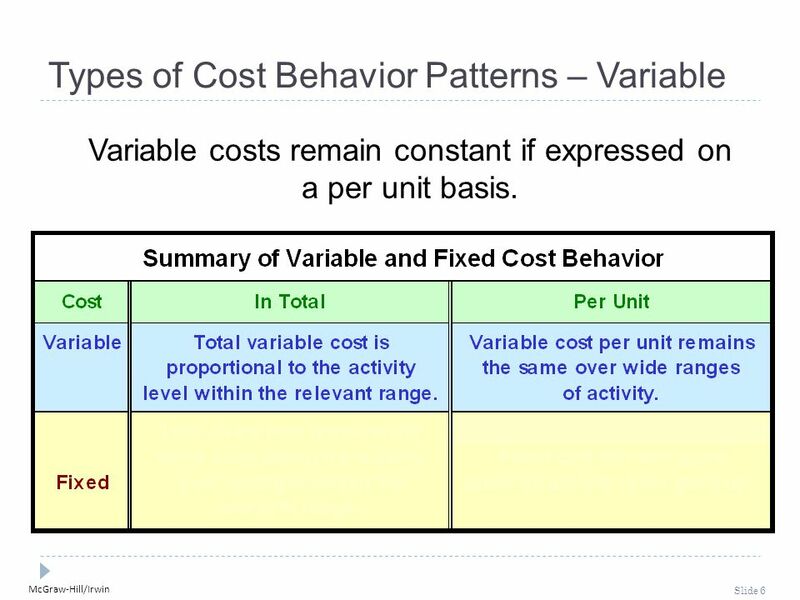 Cost Behavior: Analysis and Use Mar 3, 2004 Chapter 5. © 2008 McGraw-Hill Ryerson Limited. Cost Behaviour Merchandisers Cost of Goods Sold Manufacturers Direct Material, Direct Labour, and Variable Manufacturing. Chapter 5. Merchandisers Cost of Goods Sold Manufacturers Direct Material, Direct Labor, and Variable Manufacturing Overhead Merchandisers and Manufacturers. 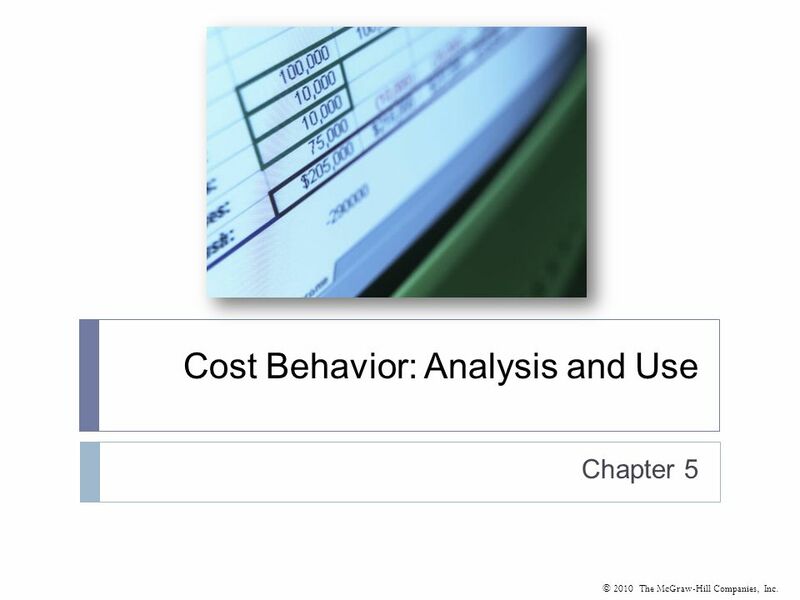 Cost Behavior: Analysis and Use Chapter 5 © The McGraw-Hill Companies, Inc., 2000 Irwin/McGraw-Hill Cost Behavior Merchandisers Cost of Goods Sold Manufacturers. Copyright © 2009 by The McGraw-Hill Companies, Inc. All rights reserved. 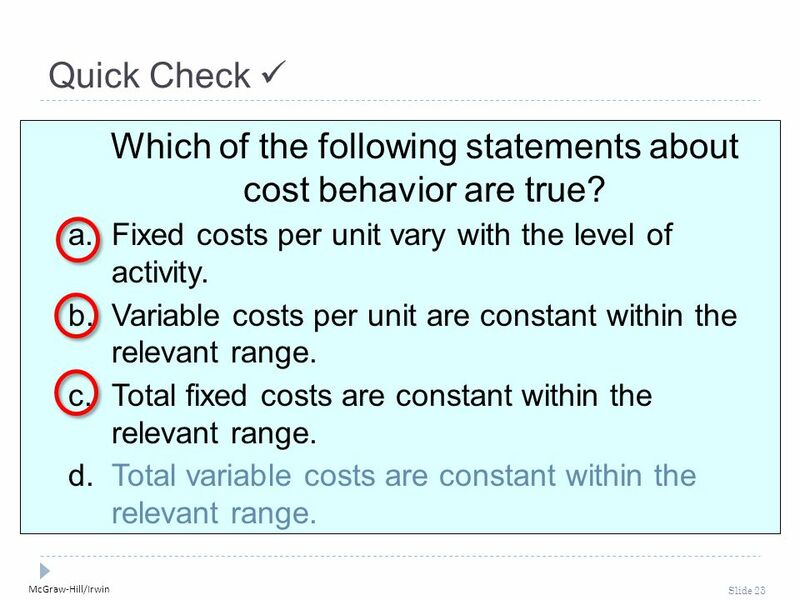 McGraw-Hill/Irwin Chapter 6 Activity Analysis, Cost Behavior, and Cost Estimation. 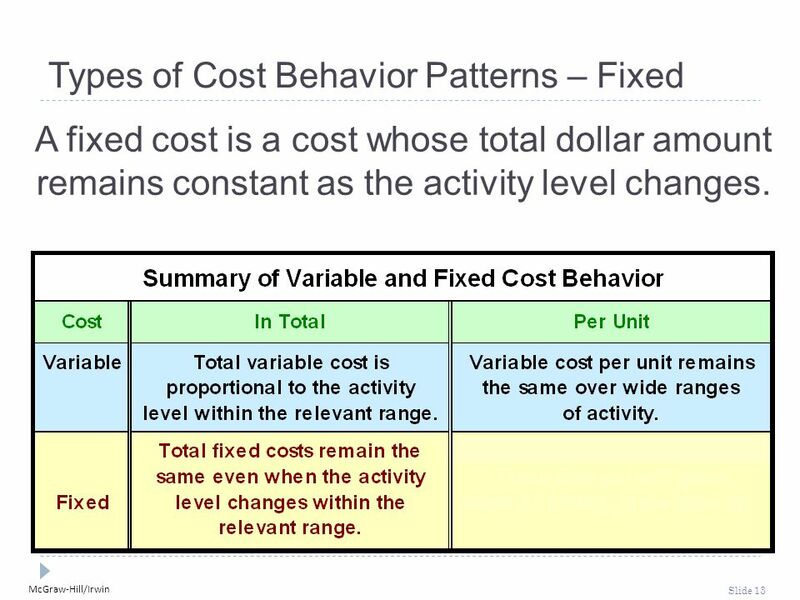 Cost Behavior: Analysis and Use Chapter 5. 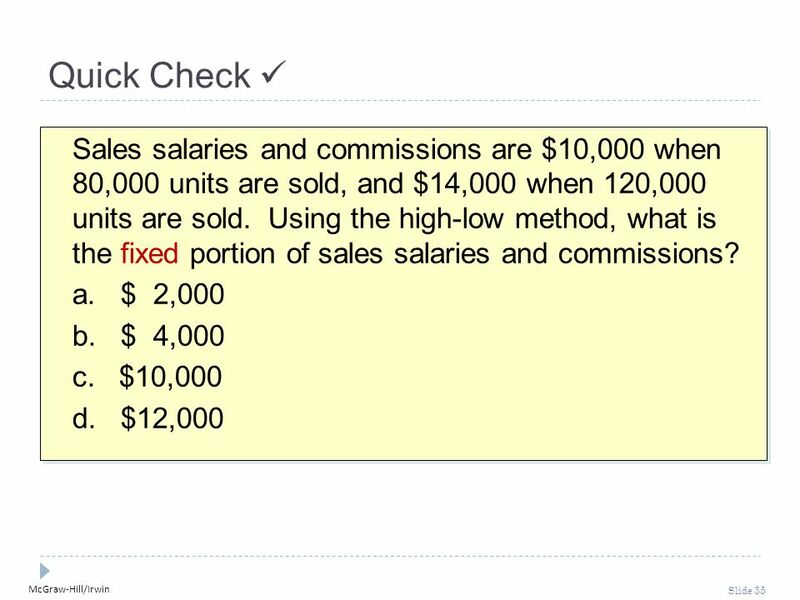 © The McGraw-Hill Companies, Inc., 2000 Irwin/McGraw-Hill Types of Cost Behavior Patterns Recall the summary. 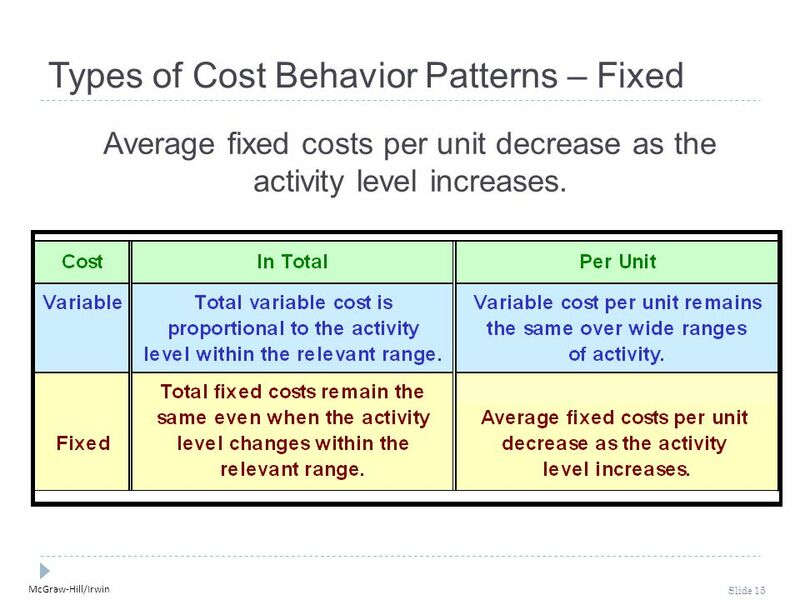 Copyright © 2008, The McGraw-Hill Companies, Inc.McGraw-Hill/Irwin Chapter Five Cost Behavior: Analysis and Use. 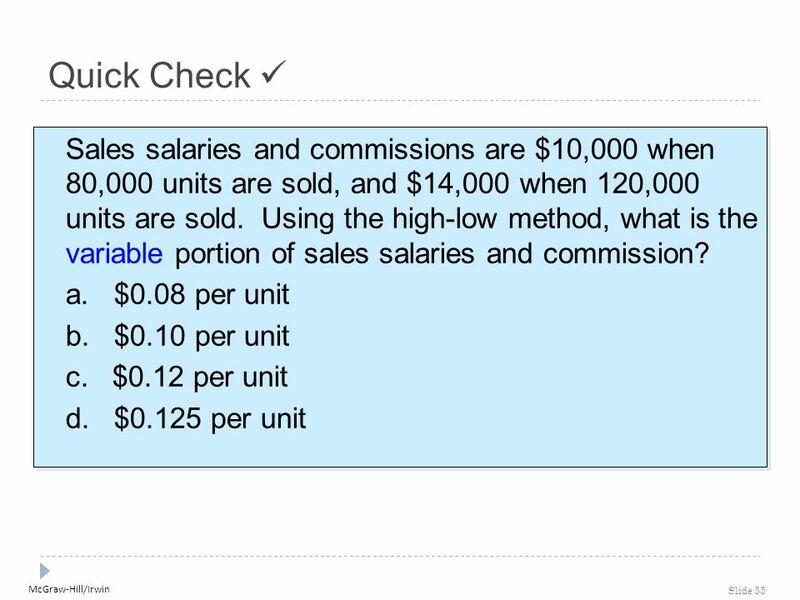 Copyright © 2006, The McGraw-Hill Companies, Inc.McGraw-Hill/Irwin 11 th Edition Chapter 5. 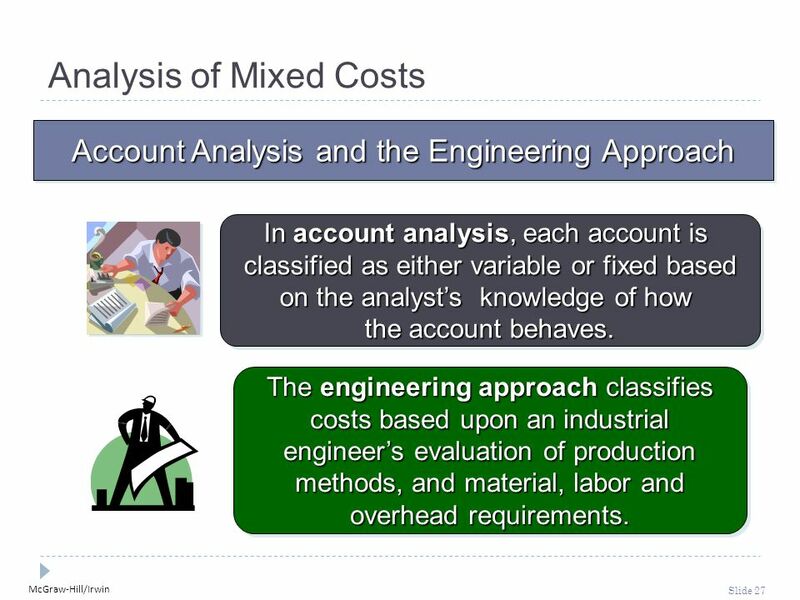 Copyright © 2006, The McGraw-Hill Companies, Inc.McGraw-Hill/Irwin Chapter Five & Six Cost Behavior: Analysis and Use- Cost Volume Profit Relations. 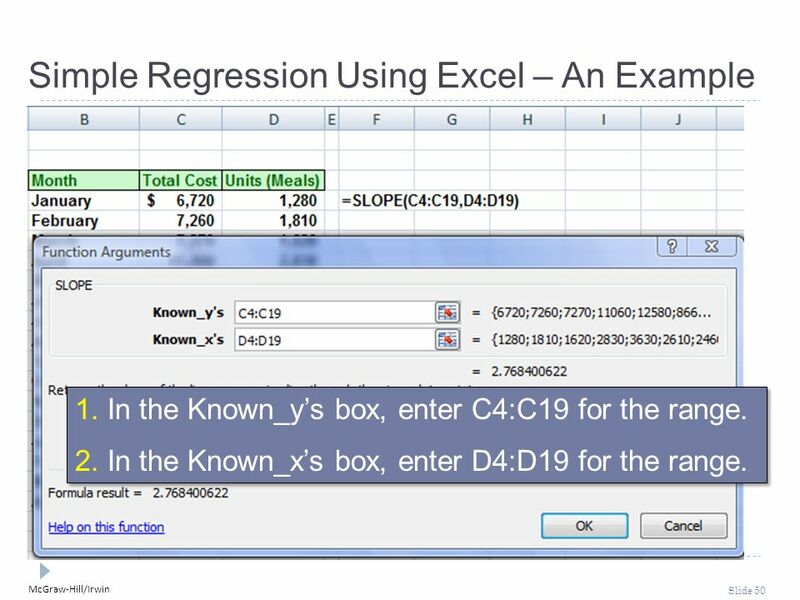 PowerPoint Authors: Susan Coomer Galbreath, Ph.D., CPA Charles W. Caldwell, D.B.A., CMA Jon A. Booker, Ph.D., CPA, CIA Cynthia J. Rooney, Ph.D., CPA McGraw-Hill/Irwin. Chapter 5 Cost Behavior: Analysis and Use. 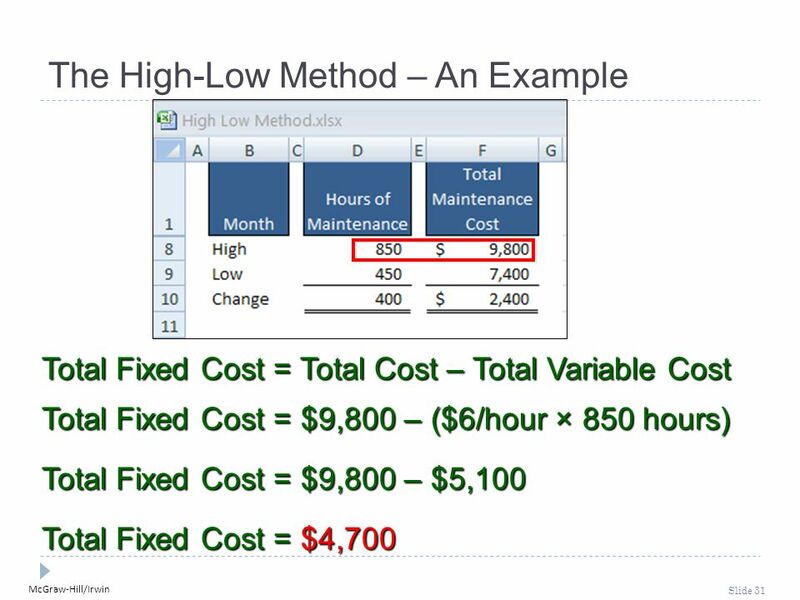 Variable Costs Total Variable Cost Graph Total Costs $300,000 $250,000 $200,000 $150,000 $100,000 $50,000 102030.